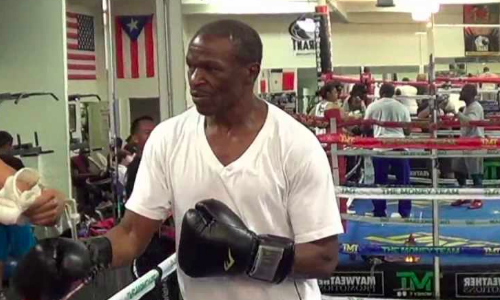 A video showing Floyd Mayweather Sr. getting knocked down in a sparring session has surfaced online. The clip, which appears to be recorded at his son Floyd Mayweather Jr.’s Las Vegas gym, shows the 66-year-old throwing a sharp jab at his opponent before being floored by what appears to be a light combination. For those unaware, Mayweather Sr was a former professional himself, who ended his career with a win-loss record of 28-6-1. After retirement, he turned to coaching and trained the likes of Oscar De La Hoya, Chad Dawson, Joan Guzman, Laila Ali besides his son. As for the younger one, who announced his retirement after defeating UFC star Conor McGregor, recently fought and stopped Tenshin Nasukawa in an unofficial bout. Time for him to come out of retirement yet again? Well, the likes of Canelo, Gennady Golovkin and Manny Pacquiao among the others would certainly hope so.